The National Highway Traffic Safety Administration recently updated its statistics on motorcycle crashes earlier this year, revealing that in 2015, there were close to 5,000 motorcyclists killed; an eight percent increase from 2014. Per vehicle mile traveled, motorcycle fatalities occurred nearly 29 times more frequently than passenger car occupant fatalities in traffic crashes. Motorcyclists accounted for 14 percent of all traffic fatalities and four percent of all people injured, and were almost five times more likely to be injured. With close to nine million private and commercial motorcycles now on U.S. roads, it is crucial to understand why all of these fatalities are occurring. While obviously, motorcycles provide virtually zero protection to riders involved in crashes, stopping a motorcycle is also significantly more complex than stopping a car because they have separate brakes for the front and rear wheels, and braking hard can cause the wheels to lock and the bike to overturn. In order to do so, let’s take a look at other statistics discussed in the latest report. 40 percent of motorcyclists killed in traffic crashes were not wearing helmets. Older motorcyclists accounted for more than half of all motorcycle fatalities; specifically, 64 percent of those killed were age 40 or older; an increase of 17 percent between 2006 and 2015. The average age amongst all motorcyclists killed in 2015 crashes was 42 years old. In addition, older riders also appear to sustain more serious injuries than younger riders, possibly due to declines in vision and reaction time, as well as riding larger-sized bikes, which tend to roll over more often. 27 percent of motorcycle riders who were involved in fatal crashes had a blood alcohol concentration of .08 percent or more, and fatally-injured riders between the ages of 35 and 39 had the highest rate of alcohol involvement (37 percent), followed by those aged 45 to 49. 33 percent of all motorcycle riders involved in fatal crashes were speeding. 37 percent of riders involved in fatal crashes were riding without a valid license. 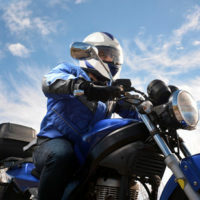 According to a report from the Insurance Institute for Highway Safety, riders of “super sports” motorcycles experienced death rates that are nearly four times higher than those that drive other types of motorcycles. These motorcycles are modified to be extremely lightweight and built for racing, and can reach speeds of up to 190 miles per hour. If you or someone you know has been injured in a motorcycle accident, it is important to seek legal representation immediately. Our experienced personal injury lawyers provide legal advice for motorcycle accident victims and survivors. Contact us today at Friedland & Associates in Fort Lauderdale for assistance with your case.